Permanent Deacon, Bruce Fraser joined us for dinner. And in reflection of today's second reading, he introduced the subject of Predestination.​ Here are Deacon Bruce's notes and resources, also available as a downloadable pdf. If everything is predetermined, why should I bother trying? Can I work harder at being a good Christian and change God’s mind? If God just chooses to save some people and not save others without looking at merits, how can that be fair? If someone is trying really hard to be a good Christian but they’re not “predestined”, will God really send them to hell? How is that fair? Does God predestine to heaven with or without looking at merits? If He predestines to heaven without looking, then does He do the same for negative reprobation (letting someone go)? God “already” knows the past, the present and the future. All time is open before Him. That’s what His “omniscience” means. “Already” is in quotation marks because when applied to God it is a misuse. If God is outside of time, if He sees all time—past, present, and future—as one, then words like “already”, “not yet”, “before” or “after” don’t correctly apply to His point of view. We really do have free choices. We truly can choose, in a meaningful, true way, to accept or reject God’s grace. We do not save ourselves. God saves us through His grace. Even our movement toward accepting His grace is due to His grace. We are saved by “grace alone”. God predestines no one to hell. That is, God does not send a person to hell simply by His sovereign choice, without looking at how that person acts. Therefore, if we end up in hell it is really through our own free choices. Pelagius was condemned at the Council of Carthage (418) and the Council of Ephesus (431). Even though God infallibly moves the human will, human beings remain free, because God’s will is transcendent. God our Saviour… desires everyone to be saved and to come to the knowledge of the truth. We do not save ourselves … God is the first mover… we are saved by grace alone. Do you remember a time when someone made fun of your family? Made fun perhaps of the job your father had, the way your mother dressed, the way your brother acted, the intelligence of your sister? How did you feel? There’s a wonderful scene from the old TV show The Wonder Years, where Kevin, the young boy, goes for a day to his father’s work (Start at 18:10). He sees his father outside of home, in action, working with other adults, and realizes, “I never forgot how I felt at that moment: My father was great man.” When they go into the next room, he then sees his father get shouted at by the boss, lambasted for incompetency, and his father is helpless. Kevin watches this and is demoralized. A truth of relationships is: When you pick on someone we love, you pick on us. When you love someone we love, you love us. We identify with those we love. Today is the feast of Corpus Christi, which is Latin for The Body of Christ. We celebrate that Jesus loves us so much that he has given Himself to us under the appearance of bread and wine. The entrance antiphon was: “He fed them with the finest wheat and satisfied them with honey from the rock.” The Eucharist is the finest gift, and, because it’s Jesus Himself, it’s someone we love. And the truth of relationships applies here: when someone hurts or loves the Eucharist, they hurt or love us. Two stories illustrate this point. 1) Last November, a Spanish artist stole hosts from Mass and used them to write the word, “Pederasty,” [sexual abuse of children] on the ground. He said he attended 242 Masses, and each time, pretended to put the Eucharist in his mouth, then walked off with it. He stole 242 hosts and desecrated them. For many of us, this sacrilege is deeply hurtful and painful, because the Eucharist means everything to us. 2) The second story is the exact opposite. 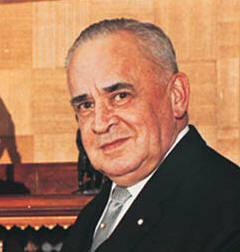 Paul Comtois was selected as lieutenant governor (the personal representative of the Queen) of Quebec in 1959. He was a politician and a devout Catholic, so much so that, when he became lieutenant governor, he requested permission from the cardinal of Quebec to have the Eucharist reserved in a tabernacle at his home. This is extremely rare (not even Deacon Andrew, for example, has the Eucharist at his home; the norm is only in churches). “The cardinal was initially reluctant… but he eventually granted it, asking Comtois to personally assure the proper custody and care of the Eucharist. Comtois’s daily routine included family prayer, and he ended his days in the chapel before the Eucharist. “As I was racing through the building to escape from the fire, I came upon my father in the chapel,” Mireille recalls. “As I was going to run to him, he firmly ordered me to jump from a nearby window, and I did, wondering why he did not do likewise. The fire… was so hot that the first firemen on the scene could not approach within 100 feet of the building. In today’s Collect (Opening Prayer), we prayed: “O God… grant us… so to revere the sacred mysteries of your Body and Blood.” Jesus is asking us to treat the Eucharist with more reverence. He’s saying, “When you love the Eucharist, you love me.” All the saints had this love: they spent hours with the Eucharist, longed to receive it, and showed respect for it by kneeling and prostrating themselves on the ground. We need to increase our love for Jesus, and then recognize that this love should be equal for the Eucharist, because it’s the same Jesus. Read the complete and original post on Fr. Justin's blog.